1. Listen to the Napalm Death song, You Suffer, fifteen times. Roy Wood has really let himself go, hasn’t he? 2. Run 100 metres, three times. If you’re Usain Bolt. Spoiler: the letter “t” doesn’t actually do anything, presumably because your wife isn’t listening. 3. Google “things you can do in under 30 seconds”, and decide they’re all a bit crap. 4. 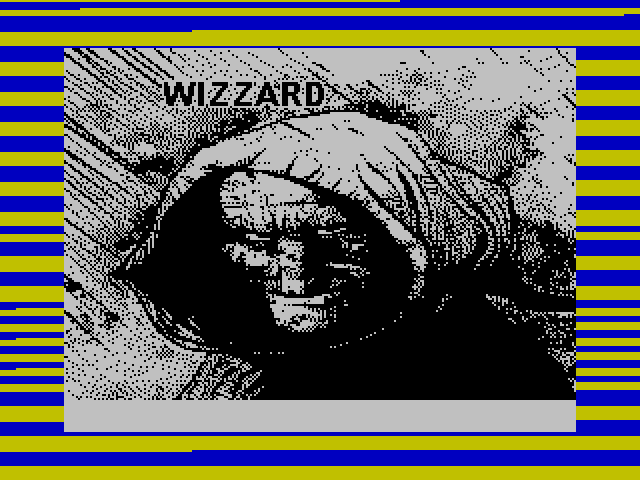 Play unclechicken’s latest game, Wizzard. …oh, there she is. Those pointy things in the background are either the pyramids of Giza, or The Point, Milton Keynes. 5. 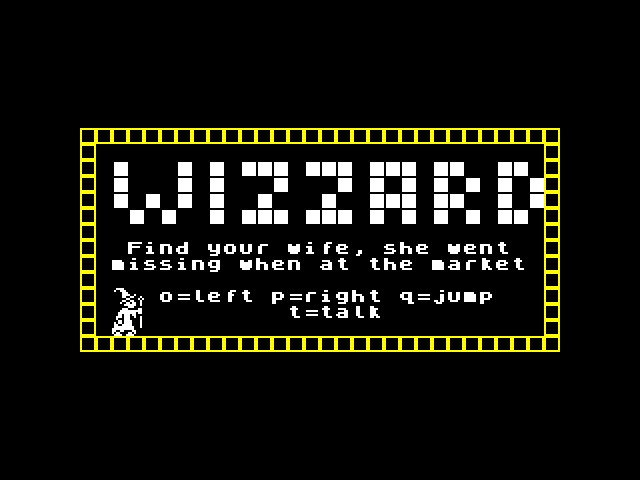 Write a CSSCGC review about unclechicken’s latest game, Wizzard. Whaaaaaat?! That’s the whole review? I hear you cry. Well, back in the early 00s you’d be lucky to get a paragraph or even a sentence. One of my entries’ reviews consisted of three words – “Argh! My ears” – which was probably more than it deserved, but still poor compensation for the sweat and toil I’d put into the game. So think yourselves lucky I’ve got to 200 words already! Score: 1 zeptosecond out of 100 aeons. The only chicken-based relative I’m aware of is Knife from Knife and Wife. Oh, and there’s Mr Chicken of course, who may or may not be related to unclechicken, although I strongly suspect Mr Chicken would cook unclechicken and put him in a burger were he forced to play BEEF II, and not purely because as a chicken merchant he would be unhappy to play a game where the player’s character’s name is based on his arch-nemesis food product. Commander Beef reporting for duty, sir! After a brief departure into playability and sensible keyboard controls for BEEF!, unclechicken has regained at least some of his lost sanity for the sequel, which picks up a few minutes after the first game left off. Upon loading, the author’s now trademark “custom font with slightly ambiguous plot” title screen appears, and pressing a key gets you straight into the heart of the action… at which point you’ll die trying to figure out how to use the key controls even a masochist would write a letter of complaint about. This is the only splash of colour you’ll see – the game is entirely “black & white TV compatible”. It’s a sideways scrolling shooter, like R-Type, although actually nothing like R-Type which I’ve done a disservice to by even mentioning it in the same sentence. 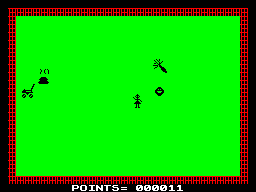 Instead I will compare it to my fifteen-year-old effort Mothership One, which I can’t be arsed to load back up, but my memory tells me was appalling (although technically it wasn’t a *scrolling* shoot-’em-up), and at least I remember it unlike a lot of the CSSCGC entries I’ve apparently submitted over the years. The aliens have cunningly disguised themselves as priceless ming vases. The particle effects are pretty good. 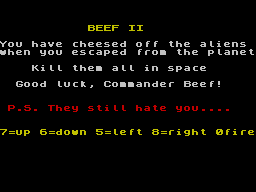 In this game, however, you’re being chased by the aliens who hate you, because leaving the planet in BEEF! 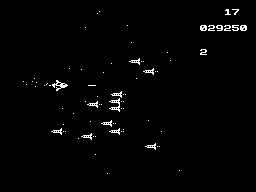 cheesed them off, and they’ve clearly sent for reinforcements, as they all appear in front of your ship rather than shooting from behind. 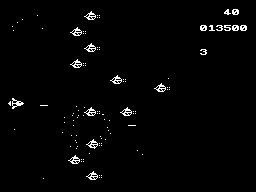 Other than that, it’s business as usual – identical attack wave after identical attack wave of enemy ships who can kill you just by being vaguely in the vicinity of your ship (and bizarrely appear to have no guns, so they just kamikaze into you), but if you try to shoot at them you discover there’s about a three second delay between pressing fire and actually seeing any, erm, fire. Couple that with the insane finger gymnastics and you’re going to fly straight into them anyway. 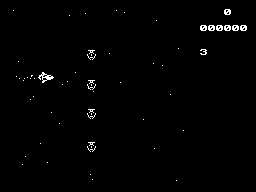 And, just as in Mrs Pickford, you don’t get a chance to see your score before you are rudely thrown back to the title screen, and then back into the game and then shot at or flown into or crashed and back to the title screen, and those aliens are getting on your wick now and you don’t remember what it was that made them hate you but it probably has something to do with chickens not getting on with cattle, and they’re going to hate you even more once you manage to get your fingers in the right place to both control the spaceship and shoot at them, and maybe it’ll be easier if you get Jeeves in here to hold down the shooty thing whilst you concentrate on not flying into the alien coming right at you and…. Elizabeth, dear sister, is that a gentleman from the press at the door? There’s another wave after this then you’re done. Unclechicken (who may or may not be both an uncle and a chicken, but his real name is Jonathan, so I’m going to call him that from now on) is back with yet another flagrant abuse of AGD in BEEF! Now with a title like that, I was expecting this to be a game in which you stick your hand up a cow’s arse (Are you sure? Ed. ), pull out a baby cow, force feed it until it’s nice and fat, kill it, and eat it for Sunday dinner. The perfect game for me, as I’m a vegetarian. I’ll just leave a space below for the awkward silence and silly questions that always follow this statement. Beef it turns out has nothing to do with dead cows and everything to do with spaceships. 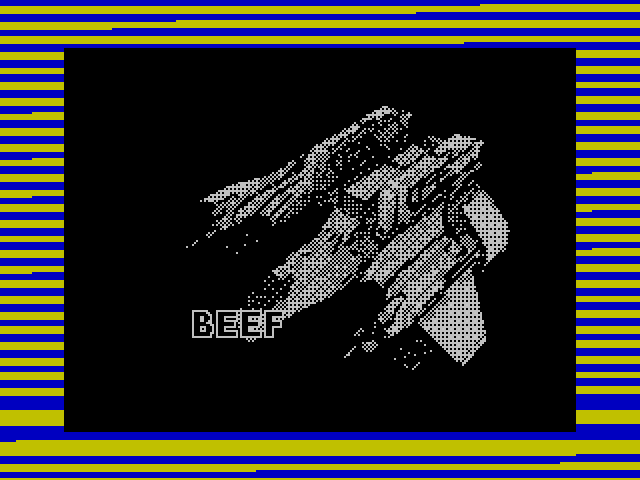 Commander Beef (it’s not explained why his name is Beef) has crashed on some planet or other and needs to escape. “Avoid the enemies, they hate you” says the title screen. D’you know what, in 35 years of avoiding (virtual) enemies I’ve never once stopped to wonder why they hate me. Perhaps they don’t like my haircut, or my glasses, or something. Unclejonathanchicken immediately wins some crap points for the misleading loading screen. I was expecting a shoot-em-up, but no, it’s the first platform game of the competition! Hurrah! Almost too good for the CGC. Almost. What have we here? 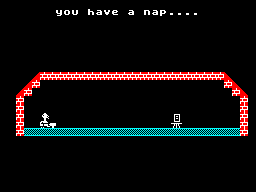 A custom font, some half-recognisable graphics, and an actual playable game, that’s what. The eponymous spacesuited hero Commander Beef wanders around the screens collecting money, avoiding the enemies (they hate you) and collecting a tool spanner (F’nar! Ed.) so he can get away. And the game isn’t half bad – after a couple of minutes I was even starting to enjoy myself. I can only assume this is an unwanted side effect of AGD or whatever Unclechickathan used to write the game. However, the game does have one or two flaws. When you die, you’re dumped onto another screen seemingly at random. And it’s far too small, only seven screens or so, and pretty easy to complete. But its biggest flaw is these flaws aren’t, erm, flawy enough to make an average platformer into a truly crap game. In short, Unclechickajon needs to try much harder to write a crap game next time… but fear not, I hear a sequel to BEEF is in the pipeline! Can’t wait! Come Come, Mrs Pickford. Its Only A Vegetable. So… it’s Bank Holiday weekend, Sunday afternoon and I’m at a loose end already. 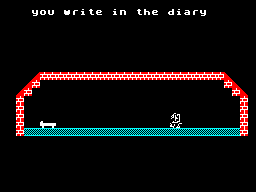 I could write some crap games to annoy Lee with, but I don’t have any inspiration for that sort of thing at the moment. I could help Lee out and review one of the games on the pile. Preferably the one at the top, as if I remove the one that has been sitting there longest it’ll knock the whole lot over, just like those giant pyramids of baked beans you don’t see in supermarkets and probably never existed except in cartoons and adverts, and maybe Supermarket Sweep with Dale Winton. Or I could take a leaf out of Mrs Pickford’s book and do a spot of gardening. I hate gardening. Mrs Pickford goes down the market. I decided to see what Mrs Pickford was up to. She’s been out in the garden all day but I think I spotted the nasty garden shite fairy, so I should probably w…. hold on, is that a CUSTOM FONT????! 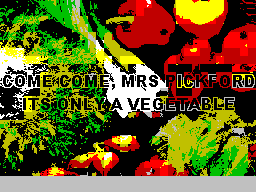 Yes, unclechicken (not Uncle Chicken, never that) is showing a dangerous amount of technical competence with his entry “Come Come, Mrs Pickford, Its (sic) Only A Vegetable”. The loading screen itself is a well-rendered colourful menagerie of vegetables, with the bottom screen area curiously left out. Thankfully the plot is minimal, at best, and the controls are ridiculous. This game employs the sociopath’s favourite keyboard controls. You play Mrs Pickford and need to avoid the stuff the NGS Fairy has sent to kill you. I assume this is the fairy equivalent of a gladiatorial contest, Mrs Pickford merely being used for entertainment rather than a personal vendetta. But maybe there is some deep-seated rivalry, and in the sequel unclechicken will flesh out the NGS Fairy’s backstory and we discover that she used to be Mrs Pickford’s guardian angel until Mrs Pickford did something unimaginable. So, there’s a steaming pile of dog shite (and that’s just the game), a lawnmower (or is it a pram? ), a smiley face(??) and something that could be an unexploded WW2 bomb, a carrot or a molotov cocktail. Either way, I’d suggest to avoid it. You don’t mess with carrots. I’m going to put a sheet over this screenshot, and you have to name the objects… actually, let’s not bother with the sheet. Everything moves very very quickly. So quickly, in fact, that I wasn’t sure this was written in BASIC. It isn’t. Beyond the instruction screen, it’s just over 7K of pure machine code. As I said, unclechicken is displaying an extraordinary amount of technical competence. 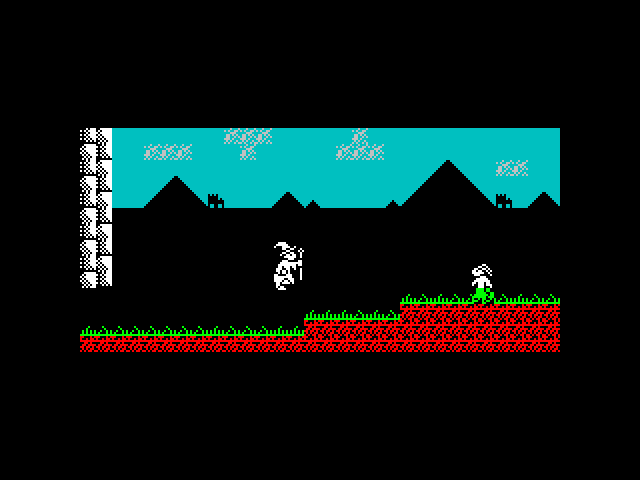 However, he has harnessed the machine code for the power of good, and managed to make the game even more unplayable than it would have been in BASIC. If you can survive for more than five seconds you’re doing well. 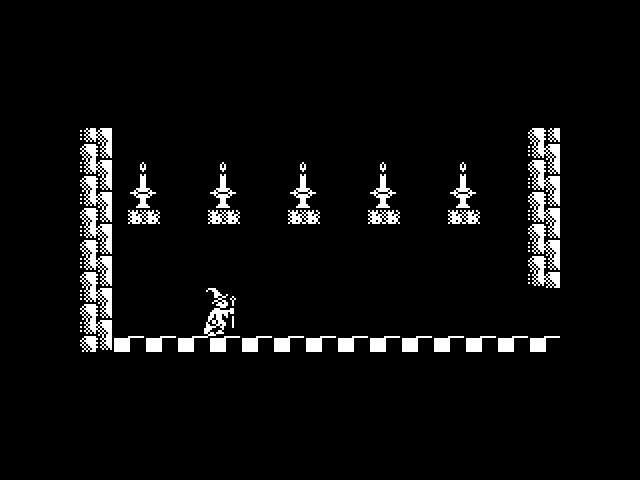 When you die you’re sent straight back to the title screen and invariably back into the action because you’re still holding down 8 or 6 or whatever key moves you AWAY from the freaky grinning bodyless face, so you have no idea what score you attained but you are sure you can last for six-and-a-half seconds this time, then the lawnmower runs you over and you’re still not sure whether that’s a vegetable or something the Germans sent over during the war, or maybe it’s that vase of flowers Mr Pickford bought you on Thursday, and it’s getting dark and you’re not sure how long you’ve been running but you think you might have missed Poldark, or did that finish last week, and if you ever see that fairy again she’s going to get acquainted with the underside of your boot. Score: Ten steaming piles of dog shite out of ten.